All dog owners wish, at some point, that they did not HAVE to take their dogs for a walk. And for those who have busy lives, unpredictable schedules, and/or live in extremely hot, rainy, or cold climates, taking your dog outside to pee or poop may not only be an inconvenience, but a real challenge. The good news is that there are alternatives to taking the dog for a walk - dog potties. Dog potties don't look much like human potties, but they don't require plumbing either. Most of them try to look like grass - some are even made of real grass or other ground cover, in an attempt to make your dog think he's outside. Dogs don't really fall for this disguise; nevertheless they can be trained to 'do their stuff' on a dog potty with a combination of scents, treats, and persistent operant conditioning. Based on human considerations, however, I've selected five of the top options for dog potties, plus a few extras, and provided some tips on getting your dogs to use them. There are a variety of dog potties available. One of the biggest issues to consider is cost. Some potty options, like the fresh grass potties or doggy pads, can get expensive. Others will be less expensive, but will require more work from you to keep odors and mess under control. Another issue is whether your dog will use the dog potty you choose. Your dog may be trainable on real grass but not accept the fake grass. You may need to try a few different options to find the best potty for you and your dog. But don't get discouraged, because once you find a potty option that works, it will change your life, freeing you from the leash when you're unable to take your dog out. There is only one dog potty that is completely self-cleaning, but at this writing it is not available. Therefore, you will have to actively manage the cleanup of the dog potty. While some dog potties do a good job in helping you manage liquid wastes and their odors, you will have to promptly collect and discard any solid waste in order to keep your house from stinking up. DoggieLawn Disposable Dog Potty is an excellent indoor potty solution for several reasons. First, for those who would prefer not to clean a potty, DoggieLawn is "no fuss no muss." It comes in a "pizza box" type cardboard container that you can simply throw out when it's full and replace it with a new one when it's needed. 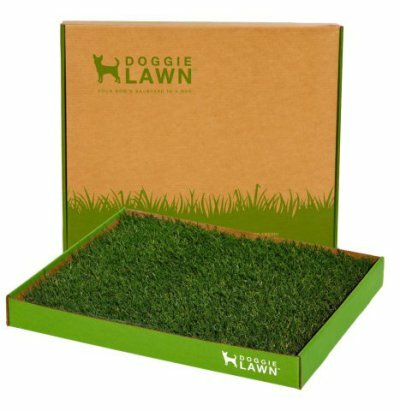 Second, for pets and owners who prefer something that is not artificial, DoggieLawn is real grass. It smells like grass and feels like grass because it IS real grass and dogs seem to really like it for doing their business. Third, this product is effective. And fourth: The company will consult with you, if needed, to help you train your dog to use the potty! DoggieLawn is especially designed with a complex root system that absorbs urine and odors. After one to three weeks of use (depending on the how much your dog uses it), all you have to do is discard it and open up a new one. The manufacturer states that one standard potty is usable for dogs up to 25 pounds. I'm dubious that it's big enough for a 25 pounder, the pad being only 25" x 21", but it probably depends more on your dog's shape than her weight. For toy and miniature dogs, there is a smaller potty that is 25" x 16". The only downside to this potty is expense. Depending on how often your dog uses this potty, you will have to get replacements every one to three weeks, but if the cost is worth the convenience for you, this product may work well for your needs. It is definitely cheaper than a dog walker! The Pet Loo Pet Toilet comes in 3 sizes and it works well for most dogs. It is one of the better options for medium to large dogs. The Pet Loo is a tray with a top layer of synthetic grass and a unique collection tray on the bottom. The shape of the collection tray allows urine to be directed to a smaller collection bin called the "Pee Pod." The Pee Pod only is removed, emptied, and then both the Pod and the tray can be rinsed. Baking soda or white vinegar can help diffuse urine odors and should be mixed with the rinse water. You can use a gentle washing solution, but make sure to rinse the parts thoroughly with water. There are some concerns about the grass topper being 'poor quality.' But there are alternative grasses you can use with the system, for example, a premium synthetic grass like Pet Zen or replacement grass pads. If you want more odor control, the Pee Pod can also hold Wee Sponge Powder, a powder that absorbs the pee and turns it immediately into a gel that traps odors. It seems to work well on odors and may be a great option to try. The PetZoom Pet Park Deluxe 3-Piece Dog Relief System and the PETMAKER Puppy Potty Trainer are less sophisticated, but are similar in concept, so you might want to take a look at them to see if one of them might meet your needs. The PAW Puppy Potty Trainer is a popular three-layer system that includes 1) an artificial grass layer that is non-toxic and odor-resistent; 2) a plastic drain; and 3) a base that collects the urine. It's easy to clean - all parts are washable with soap and water. The PAW Puppy comes in small and medium sizes. Both sizes are suitable for small dogs of both genders and, possibly, okay for medium females. You can purchase a double small pack or a double medium pack. The doubles are a good bet. For larger dogs, you can attach multiple Potty Trainers together. The Porch Potty Premium Grass Litter Box For Dogs is a great solution for owners with a patio and a source for a hose that they can use for the potty. The Porch Potty is pretty large at 2 x 4 feet, the largest single potty we've seen. The potty has a high quality resin frame surrounding either a fresh grass patch or a high quality artificial grass patch that looks and feels a lot like real grass. You can choose either. Then you can install a drain hose or drain container and use a manual rinse or the Porch Potty sprinkler system. The potty is easy to use and easy to clean. The innovative design enables drainage to a container stored under the Porch Potty or to a drain hose. This is suitable for dogs from 5 to 120 lbs. You can buy it here and read reviews for the Porch Potty here. No, it's not grassy, or even fake grassy, but if you can train your dog to use it, it will save you money and it's easy to clean. The Klean Paws Indoor Dog Potty does what it says: keeps your dog's paws clean (or Klean) if she urinates on it, because the dog pee drops through the holes in the grid. It's advisable to place a puppy pad inside the 21.5" x 16.5" x 1.25". But that just makes it really easy to clean! The manufacturer indicates that the Klean Paws Indoor Dog Potty can be used for cats and rabbits, as well as dogs. With one of these top 5+ best doggy potty solutions, you don't need to have your life controlled by your dog's bathroom schedule any more. In addition to the training instructions that accompany some of the above dog potties, there are some really good training ideas on the web that will help your dog learn to use his potty: I like Training an older dog to use an indoor dog potty by Doggy In The City. It will take some experimentation to see which product your dog will use and which works best for your lifestyle and pocketbook. But the investment of money, effort, and time you make to find a great indoor bathroom solution will definitely be paid back many times over by the freedom and convenience an indoor potty will provide for you and your family. 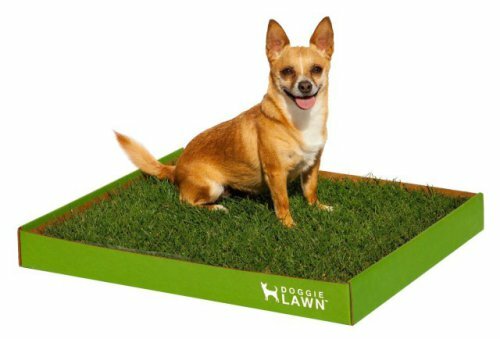 If you have a fake grass potty, put some real outdoor grass or bark on top of your dog potty, better yet if it's peed on. For male dogs, there should be something like a small (peed-on) fire hydrant, or a small tree stump on the dog potty. Frankly, another dog's pee is even better to entice your dog to the dog potty. If your pet leaves a spill around your house, you may want to try my favorite, Rocco & Roxie Professional Strength Stain & Odor Eliminator, or Particular Paws Pet Stain Remover, which also performs well on pet stains. Also, if your pet tends to miss the potty area, lining the exterior with these All-Absorb Training Pads may be a good way to keep the mess to a minimum. Most dogs require a good deal of training to use an indoor potty, so be patient. Soon, your dog will be enjoying the toilet as much as this big guy!